Hiroshima University (Development Technology)interdisciplinary and practical subjects necessary for international development and cooperation,including economics, environmental science, engineering, ecology, agricultural science, pedagogy,sociology, international politics and peace science. The school as a gathering with internationalcharacters offers a special place where the students with different expertise from various countrieswith different cultural, social, educational, political, and economical backgrounds are able to fostercloser ties each other and share the common agenda and goals in international development andcooperation.JDS fellows will belong to Development Technology Course in the Division of DevelopmentScience. Division of Development ScienceThe Division of Development Science nurtures those specialists who contribute to creatingsustainable society in developing countries in social, economic and environmental aspects,namely professionals for international institutions and aid-providing organizations, administratorsand academic researchers. The division offers courses on various issues on economicdevelopment, socio-political and peace studies, environmental management, infrastructureplanning and design, and biological resources development. The courses are designed to providea systematic and efficient teaching and research by utilizing an integrated approach to the socialand natural sciences and methodologies. (1-2) Department of Development Technology(1-2-1) Development Technology CourseWe conduct research and education, from an international perspective, related to a variety oftechnologies that can facilitate sustainable development, based upon our knowledge of thelocal environment of a particular country. More specifically, our focus upon developing countries,primarily in Asia, includes the following areas: disaster prevention, urban/regional andtransportation planning, marine development and usage, development of environmentalmonitoring methodology, ecosystem conservation and management, and biological resourcedevelopment and usage. 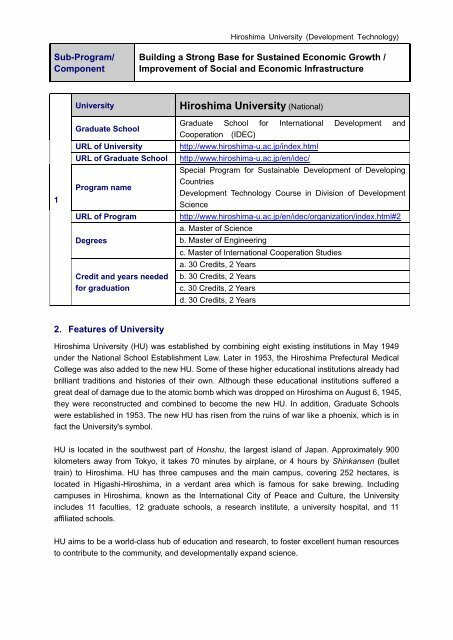 Hiroshima University (Development Technology)The Development Technology Course provides the program that consists of three phases:preliminary education (phase I), practical education and research (phase II), follow-uptraining (phase III). The usual program (for all students including non-JDS students) is alsoimplemented in phase II. (1) Usual Program in Phase II(a) As a general rule, JDS international students will study the Graduate School’sdevelopment technology course and learn global views on earth systems andenvironmental science. They will also master practical, local development technologiesrelated to watersheds, ecosystems, urban areas, transportation, and energy. In particular,they will implement the strategies in the master’s thesis research with emphasis on PBLeducation and application. Classes in the following specialized subjects are offered:regional and urban engineering, transportation engineering, transportation planning,tourism policy, ground disaster prevention engineering, environmental simulator, biomassenergy technology, renewable energy systems studies, sustainable architecture,management and conservation of ecosystems, grassland ecology, marine hydrodynamics,and marine environmental conservation. (b) All students are required to join the seminar held by their supervisor every week.Through the seminar classes, student can receive more deliberate supervision (researchplan, literature review, academic presentation, and academic writing) and obtain basicskills necessary for academic research (analytical methods and result interpretation). (c) Through the research grant project, we actively promote field research by students. Toobtain the research grand, students are required to prepare a feasible research plan. In thefiled too, students are monitored regularly by professors, and are able to obtainappropriate advices from them. Until now, several students have conducted their fieldresearch and survey with the support of the grant. (d) We provide a wide variety of lectures and seminars including an intensive course“Natural Disasters and International Cooperation” by Kenzo Oshima (former UnitedNations Under-Secretary-General, Advisor to the President, JICA), a lecture by a WorldBank’s expert, and intensive courses by researchers of the Institute of DevelopingEconomy (IDE-JETRO).For JDS students, we provide the following special program in phase I (preliminary education),phase II (practical education and research), and phase III (follow-up training). Note that ourspecial program has been formed through our 10-year experience of acceptance of JDS studentsfrom various Asian countries (since the inception of the JDS program). Thus, we do have highconfidence that we provide ample support for JDS students in terms of their personal life as wellas research. (2) JDS Special Program in Phase I: preliminary educationPreliminary education aims to make accepted candidates prepare for studying advancedmaterials in our course through distance education. Candidates are provided with textbookson development technology and are required to conduct self-study under the instruction ofprofessors. Candidates need to submit periodical reports by e-mail and take exams to confirmtheir achievements.  In addition, candidates with low English ability are also provided withEnglish language textbooks and are required to submit periodical reports by e-mail and takeexams to improve their English skills.